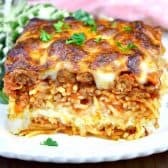 Million Dollar Spaghetti Casserole is an easy hearty casserole that is both budget-friendly and easy to make. This casserole is simple and a delicious way to feed a family or a crowd! Bring a large pot of salted water to a boil. Cook pasta according to package, drain well and return pasta to original pot. Add 1 jar of prepared spaghetti sauce and combine. Set aside. In a large skillet, heat 2 tablespoons of olive oil over medium heat. Add onion and garlic and cook until they begin to soften, about 5 minutes. Add sausage and 2 teaspoons Italian Seasoning to skillet, and cook until no pink remains. Drain well. Add 1 jar of spaghetti sauce to skillet. Set aside. In a medium mixing bowl, combine Cottage cheese or ricotta cheese, cream cheese, sour cream, 1 cup mozzarella, and 1 teaspoon Italian seasoning. Set aside. Place half the slices of butter in a 9x13 baking dish. Spread half the spaghetti in dish, then spread cheese mixture evenly over spaghetti. Spread remaining spaghetti over cheese mixture. Top with the remaining butter slices.Pour tomato meat sauce evenly over top layer of spaghetti. Top with remaining mozzarella and bake in preheated oven until casserole is heated through, about 35-45 minutes.